Obamacare created a new entitlement through its exchange subsidies and vastly expanded another one, Medicaid. The Congressional Budget Office expects these two pieces of the law to cost over $1.8 trillion over the next decade. To offset some of this new spending, the law includes 18 new or increased taxes and fees that are estimated to bring in nearly $800 billion in new revenue from 2013-2022. 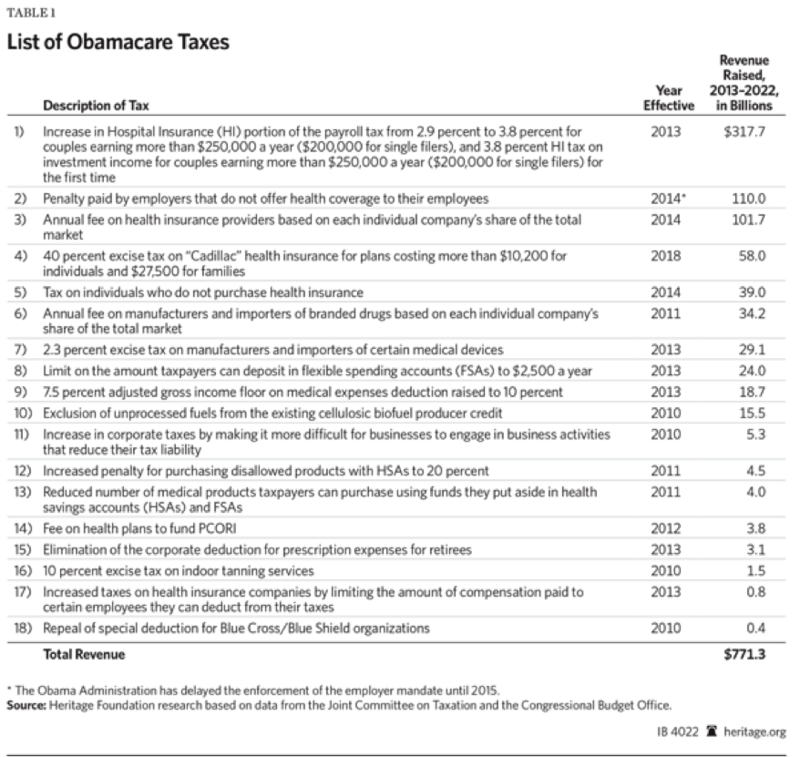 Many of Obamacare’s taxes fall directly on the middle class, breaking the president’s promise to the contrary, while others will affect taxpayers indirectly through increased costs for goods, higher insurance premiums or lost wages. One of these taxes (#3 in the table) has garnered media attention this week because it is going to be assessed on the federal and state governments. This tax, the health insurer tax, must be paid by each insurer based on the insurer’s share of the market. Thus, private Medicaid managed care companies that are paid by both the federal and state governments, must pay the tax as well. Altogether, the tax is expected to bring in $8 billion in revenue this year and about $100 billion in new revenue over a decade. Of course, it is the taxpayer that will end up paying this tax. However, any taxpayers that are also enrolled in private insurance will likely pay for this particular tax twice–once through state and federal taxes and then again via increased premiums as their health insurer is likely to pass on the cost of the tax in this way.